Keep it tight during the holiday season! The growing use of CBD based supplements is enchancing the way we work and heal our bodies. Join Caniventures for an blazing BODY HIGH workout and education session on using CBD to pump up your workout reginme. Each participant will expierence CBD pre or post workout product and we will work you out with explosive hgih intensity interval training (HIIT). Participants of all workout levels are welcome! All workouts can be modified to match your fitness level. 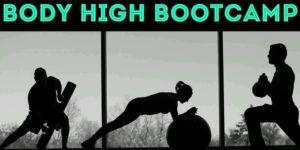 Take your fitness goals higher at BODY HIGH BOOTCAMP!